Umm.. I guess I owe you folks an apology. 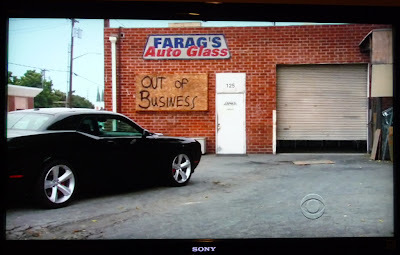 A couple of people thought it was neat that my car was used on the recent NCIS episode and even neater that they paid me $1,000 for doing so.. I was just joking. That's why I put the "haha" in there. Most assuredly, that was indeed the back of my office building, though! In all of it's lightly modified glory. They should have paid us more than $400 just for being able to find something that needed so little work done to make it suitable for the show. Anyway, sorry about the car part - I thought you'd know I was funnin' you! Nearly a month ago I had posted that NCIS Los Angeles was going to use the back of one of our buildings for a scene in an episode. It aired last night. They showed all of about 10 seconds, and that was it - for that they paid us 400 bucks. I guess that equates to an hourly rate for an NBA star? Anyway, here is the picture. Of course they added the auto shop sign and they did place a board over the window below it, but otherwise what you see is what you get. It's what I see every day of the working week (click on the picture for a larger version). Oh, and yes, that is my car in the picture, too. They paid me $1,000 for using it. Haha..